Eventually, we found a fisherman who was willing to sell, and, after long negotiations, we drew up a contract for Shs 800 for a ngalawa called Si-haba which means something like ‘little but enough’ in English. The price may not seem very high nowadays but it was equivalent to £400 then when pounds were much more valuable than they are now? The contract contained a provision that the seller would sail the ngalawa to Dar es Salaam (100 kms) on a specific day to coincide with the arrival in the harbour of the Scandinavian liner the ‘Drammensfjord’. The money was to be paid on delivery in Dar. All went well and, on the agreed date, the boat was duly delivered to the beach just inside the entrance to Dar es Salaam harbour. We tied it up to a palm tree for three days until we could arrange for a ships broker to arrange all the formalities and then for young Sjur (with the help of a friendly fisherman) to sail it across the harbour so that it could be lifted on board the liner. We were all very happy because it seemed that we were finally going to be able to transport the canoe to Norway. But no sooner had it been lifted on to the ship than there was a serious problem. The dock workers on the ship greeted the arrival of the canoe with hostility and immediately went on strike. They refused to continue to load other goods onto the ship or even to allow the ship to leave the harbour unless the ngalawa stayed behind. They protested that people were going to make fun of this primitive canoe in Europe. Considerable diplomatic skill was required to solve the problem, which eventually involved the Dar Salaam Regional Commissioner, and the workers were eventually persuaded to let it leave. We joined the ship on its 26 day non-stop journey to Aalborg in Denmark. 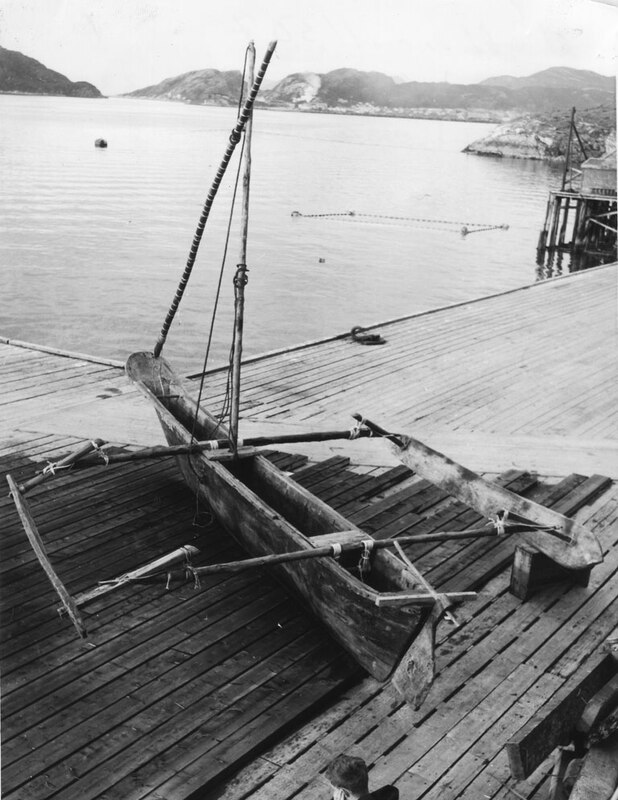 Then it had to be loaded on to another ship which took it to Oslo and then on it to a coastal steamer all the way to Bodo, the town where we lived, which is 100 kms north of the Arctic Circle. We also took our dog Pelle on the ship but he had to spend eight weeks on board before he arrived in Oslo for four months of ‘arrest’ in quarantine. When we met him again he was crying for more than an hour. Si-haba is 23 feet long and 4 metres broad with two outboards of 45kgs each. It had a 9 metre sail boom and a 14 sq. metre Latinsail of cotton. But Si-haba was not well suited to the arctic with ‘malsreams’ in the narrow sounds and dangerous winds. It could move at 15 knots with a strong wind from behind. To reduce the risk when on night fishing trips we equipped it with a 4 HP outboard motor. On one occasion, with my other son Ole Christian, we did not return until 4.30 am. Si-haba proved of great interest to the local inhabitants and also to the numerous tourists from around the world traveling on daily cruise liners from Bergen to the North Cape all the year round. We kept the boat until 1989 and then donated it to the Norwegian Maritime Museum in Oslo where viking ships and the famous Kon Tiki boat are on display. Nowadays Si-haba rests in a strorehouse at the War Marine HQ at Horten, 60 kilometres west of Oslo.